What if everything in your life you thought you knew was a lie? 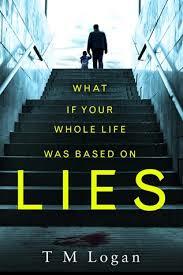 Lies follows the life of Jo and his family. When Jo is driving home with son William and William spots his mothers car going into the carpark of a hotel Jo decides to follow her to see what she's up to. From there Jo's life is turned upside down and everything he thought he knew turns out to be a lie. With Jo's life crashing down around him and the police after him for murder can Jo put all the pieces together in time to figure out what is going on and prove his innocence before its to late? Or will Jo end up going to prison for a murder he didn't commit, a murder he doesn't even believe has taken place. Can he save himself and keep his family together or do other people have other ideas? As i as was reading this book i thought i had a pretty good idea on what was going on, on who was to blame and the how the story was going to end. I thought this was going to be a pretty typical who done it kind of book. Well turns out i was only half right. The other half and well the major half i did not see coming. i have given this book 4 out of 5 stars, however i did pay for this book as it was only 98p which would usually get itself inn the 5 star rating but as i don't think i will reread it i have given it 4 stars however, i would recommend this book for anyone looking for a good psychological thriller that keeps you guessing. I found the characters in this book to be rather annoying. Jo kept going on about how he wanted to make his Marriage work and stay with his wife after her affair yet he constantly checked her phone, didn't trust her which of course is understandable i just never understood why after she hurt him so much and got him into all the trouble she did why he stuck by her and why he wanted to make the marriage work. Also Beth going on about how she needed her husband back she couldn't live without him after his affair. I can't stand women who need a man to define them and found she just came across as pathetic in the beginning of course as the book went on i understood why she was doing this and realised that it had done exactly what it was meant to. This book was chosen as one of the books for my bookclub. Not a bad choice and i did enjoy it.